Survey data from various sources (Industry Week, Lean Enterprise Institute, McKinsey&Company, etc.) over the last 10 years indicate that Lean transformations typically fall well short of expectations, which indicate failure to greater or lesser extents. Personal experiences, observation, and other data confirms these findings. This creates risk for Lean management in terms of its acceptance and use by business leaders and employees, as well as the long-term survival of the Lean movement. While Lean transformation models can be helpful in guiding actions, they are not informative when it comes to identifying specific Lean transformation process failure modes. Pillars of Toyota Production System (TPS) and the Toyota Way are not apparent. Incorrect kaizen process and infrequent kaizen practice. Little or no material and information flow. Unwillingness or inability to bring the “Respect for People” principle to life; e.g. continued pattern of blaming people for problems and errors. Reduction of Lean management from a system to a small set of tools; i.e. continuation of conventional management practice but with some new Lean tools. Lack of executive participation in continuous improvement. Bureaucratic continuous improvement; e.g. “check-the-box” kaizen. Continued use of anti-Lean performance metrics. Stakeholders experience zero-sum outcomes; e.g. layoffs. Unresolved systemic worker complaints resulting in poor engagement and participation. Significant gaps between expected outcomes and actual outcomes. Failure to evolve and improve the Lean management system. Abandonment of Lean management, for a variety of reasons. Isn’t it irresponsible to promote Lean yet not investigate failures to determine root causes and countermeasures? These indicators usually occur in combination with one another. 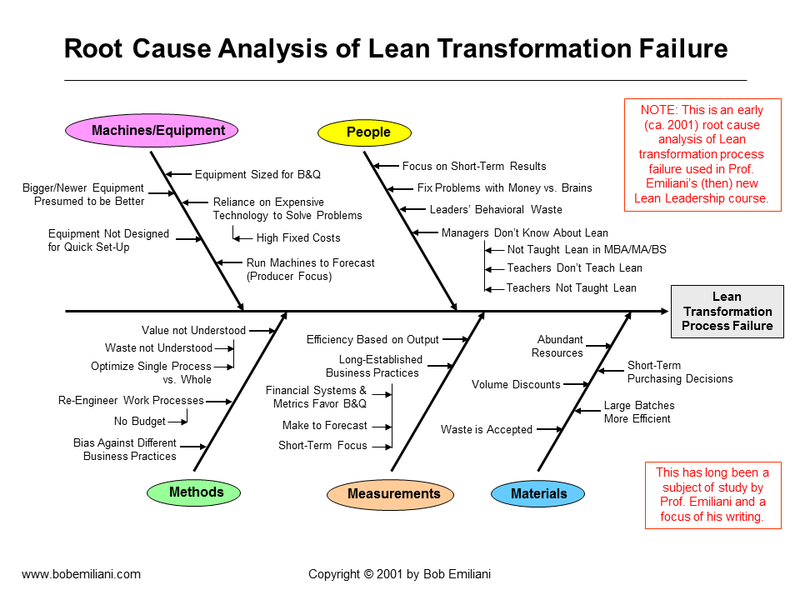 More detailed analysis of Lean transformation process failure will yield a better understanding of the root causes of these different indicators of failure and lead to the identification of practical countermeasures such that Lean transformation successes would, over time, exceed Lean transformation failures. Respect for humanity demands that such failures be carefully studied. Lean management consists of principles, methods, and tools. Common failure analysis methods such as Failure Mode Effects Analysis (FMEA), and problem analysis methods such as A3 Reports, seem to have greater utility in illuminating technical aspects of Lean transformation process failure. Yet, because Lean transformations must be led by top leaders, leaders play a special role in determining its success or failure. Therefore, human factors are expected to be of great importance, and a focused method to determine failures along the human dimension is also needed. We know Lean management to be a completely different way of thinking for both leaders and workers. Therefore, a formal failure analysis method is needed which carefully examines the different forms of illogical thinking and poor decision-making. 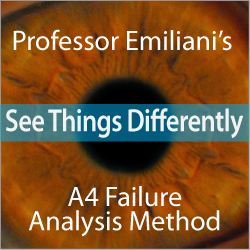 The A4 Failure Analysis Method that I developed beginning in 2004 fulfills such a need. 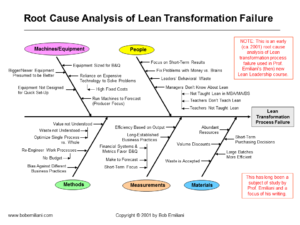 In a recent blog post, “Lean Transformation Failure Analysis,” I suggested that the two organizations recognized as leaders of the Lean movement should take a more active role in determining the causes of Lean transformation process failure using formal methods of failure analysis. This is necessary in order to address the growing concern among Lean practitioners that Lean transformation failures far exceed Lean transformation successes. Past solutions to this known problem seem to be largely ineffective, which, therefore, calls for a new approach to problem-solving. My focus for more than 20 years has been Lean leadership and the role of leaders in failed Lean transformations. This is but one “bone” in a fishbone diagram. However, given the importance of leaders in Lean transformation, is seems plausible that leadership is a major contributing factor in Lean transformation process failures. This is not to blame leaders. Instead, it is an exploration into the habit of mind that leads to patters of thinking and decision-making that inadvertently undercut well-intentioned efforts to convert an organizations management practice to Lean. People are not the problem; it is the process that leads to the patters of thinking and decision-making that impair one’s ability to learn, lead, and practice Lean management. In summary, I am happy to freely share my A4 Failure Analysis Method with you and wish you success in its use. I am sure you will learn a lot. But, more importantly, I am confident that will uncover root causes and identify countermeasures that lead to greater Lean transformation success – as well as improved management thinking and decision-making. I hope you will be so kind as to share your findings with me and others in the Lean community. And please don’t forget that you can use the A4 Failure Analysis Method for any type of business or management failure. Conflict of Interest Statement: I have no business affiliation with any organization that promotes Lean. Why Formally Analyze Business and Management Failures? Generally, the purpose of formal analysis of business and management failures is to learn from mistakes and avoid future failure. It is also to improve leadership skills and capabilities, improve management thinking and practice, and improve the organization’s ability to achieve its strategic goals and operating objectives. In relation to Lean management, the challenge, first and foremost, is to do no harm. To execute Lean transformations in ways that do not harm to employees or other key stakeholders; e.g. customers, suppliers, investors, communities, or competitors. To create a better and more healthy work environment where employees can live up to their potential and experience greater fun and happiness with work, and enjoy more satisfying relationships with co-workers and others such as business partners. To experience mutual gain and mutual prosperity. To live a better life. In pursuit of a vision where people leave work healthier than when they arrived. The complex web variables in business and management failures can be sorted out to a degree such that practical improvements can be made in order to make things better for people. The goal is improvement, and the A4 Failure Analysis Method can help achieve that. In your analyses of Lean transformation failures, it is possible that you will begin to recognize the weakness of Lean (an MIT researcher-derived interpretation) and the strength of TPS and The Toyota Way (the genuine article). 1. What: The A4 Failure Analysis Method is a structured method for identifying the root causes of major business and management failures. 2. Who and When: First developed by Prof. Emiliani in the spring 2004 and first offered as a graduate-level business school course in the summer of 2004, titled: “Failure Analysis of Management Decisions.” Taught to graduate students and continuously improved through 2016 and beyond. Understand and learn about complex business problems. Learn how to apply formal root cause analysis to business and management problems. Learn the types of errors commonly made by managers that contribute to flawed decision-making. Identify and understand the root causes of failure in management decision-making. Identify practical countermeasures to prevent recurrence. 4. Applicability: Any type of business, business process, leadership, management, product, or service failure. 5. For Use By: Anyone at any level of the organization, preferably those who are more distant from the failure because they will analyze the data with greater clarity and objectivity. It should be completed individually. The failure analysis team can the reconcile the results. 7. Intended Use: For good, not for evil; learning and improvement; to reduce the human and financial costs of failure; to avoid repeat errors that lead to failure; to avoid repeat failures; to improve leadership skills and capabilities; to improve management thinking and practice, to avoid doing current or future harm to stakeholders. 8. Results: Quality of failure analyses depend upon various factors including available data and skill of analysis. Bias in data or analysis will diminish the validity of results. 9. Limitations: Follow instructions for best results. May or may not need to use other formal failure analysis methods to develop a more comprehensive understanding of failures. 10. Misuse: Punitive purposes such as: Blame people, departments, or companies; maintain the status quo; as a basis for litigation, or the like. 13. Warranty: None. Use as-is and at your own risk. User responsible for any and all results. Results will vary (see items 7 through 10). 14. Contact: Prof. Bob Emiliani, bob at bobemiliani.com, www.bobemiliani.com. External Sources: Collect stories on a company or organizational failure and arrange them in publication date sequence. The failure can be for any company in any industry. Sources for stories should be articles from The Wall Street Journal, The New York Times business section, The Washington Post business section, Fortune, Financial Times, etc. Save the articles as .pdf files or scan the paper copies into .pdf files. Combine all the stories into a single .pdf file, oldest story first to newest story last. It could contain a total of anywhere from 50 to 350 pages. Internal Sources: Pay an independent freelance newspaper reporter to interview people within and outside of the company and write a 50-350 page proprietary story about the failure in chronological order of events. Reporting should include quotes from various persons (names and positions can be changed). This will be the source material for the failure analysis. These failures must be analyzed objectively, even if the failure is a recent one that involved current leadership. Remember: Lean people don’t blame others for problems or worry about who is at fault. Instead, they focus on root causes and finding countermeasures for improvement. Most leaders and managers fall prey to the mistaken view that failure by another company or organization in a different industry or in a different country has no bearing on them or the company. Instead, leaders and managers should be very interested in any type of major business failure because there is much to learn from and apply to their work – especially failures made by others. Learn from other’s mistakes because it is very low cost and highly effective. After hundreds of business and management failure analyses, we find that the root causes of failure are independent of the specific type of product or service. They are the result of common errors in human thinking and decision-making. What happened to a company or organization in a different industry is relevant to your company in every case. For example, BP’s Gulf oil spill may seem irrelevant to you because you are in the electronics business. But, think again: The point of the BP failure was not spilled oil (bad as that was). It is that the worst that could happen did happen. What caused the oil spill will be similar to what might cause the worst to happen to your company. Also, recall that the spill occurred because of a desire to save a few million dollars, which ended up costing BP tens of billions of dollars. Faulty decision-making is not the exception; it is the rule. Conducting failure analyses on a regular basis, individually and as a management team, will greatly deepen your understanding of the causes of failure and help you identify and implement countermeasures that help ensure such major failures do not occur in your business. Over time, you will discover patterns of failure and recognize there are many similarities and the differences are remarkably few. Companies (leaders) that are willing to learn from both good and bad outcomes are comfortable looking forwards and backwards in time, and up and down across industries to learn from others. As a manager, it’s your duty to understand how others fail and ensure that such outcomes do not occur in your company. Firstly, you must focus on the process and not on the people. Failure analysis cannot become another means to blame people or “hold people accountable.” Do not politicize failure analysis to achieve narrow personal or organizational interests. Focus on improvement. If you are unable to do this, use the A4 Failure Analysis Method to analyze why the company is unable to focus on improvement. That will reveal other important problems that need to be corrected. Secondly, understand that your root cause analyses may not be exactly right, and the countermeasure may not be perfectly effective. Do not be overly concerned about that. The point of doing root cause analysis is to improve your analysis skills, improve processes, and avoid repeat errors. You will be much better off than if you did not engage in failure analysis. You do not have to read every word on every page. The articles will be redundant in many places because they represent a chronology of events and often repeat information that was presented in earlier articles. The most critical step is to understand what the problem is. There are usually one or two main problems and many smaller but related problems. Carefully scrutinize the conventional views and conventional wisdom expressed in the articles by the reporter or the people they quote when discussing the problem(s). These views may be on-target or could mislead you. Think about how your beliefs and untested assumptions relate to understanding the main problem(s). This may influence how you set up your 10 Whys root cause analysis. Since we are focusing on management (i.e. human) decisions, it is likely that your 10 Whys will sometimes focus on human factors – ones that are often related to common beliefs, untested assumptions, or behaviors. It appears to be a problem in operations, but could the actual cause lie elsewhere (such as in finance, engineering, or sales and marketing). What role did business metrics play in the decisions that were made? What are the key decision-making criteria? Are they truly sound criteria? Was a “herd mentality” in play? Were managers simply following others? Why? Are there flaws in management’s mindset that distorts the information they receive? Is management’s perception of reality inaccurate? What’s causing that? What does management do to preserve their inaccurate views of reality? Does management overestimate what they know or think they know? What personal attributes do top managers exhibit that block the flow of information or contribute to flawed views or decisions? What causes that? Don’t fall for the common corporate excuses: lack of resources, no time, external factors, etc. These are not root causes. You must think more and dig deeper. If you get stuck, think about how you would respond if you were in that situation, and, what is driving your response. Ask: “Why would I do that?” Using yourself as an example will help. In most cases you are as smart and also educated in the same ways as the people who have made the error. In other words, we all fall into the same traps most of the time. Fall of Lehman Brothers, Merrill Lynch, etc. Nobody involved in these cases were uneducated or stupid. But, what if, instead of being educated to succeed in school and on-the-job, managers have inadvertently been educated to fail? Give careful consideration to that perspective. The Wisdom of Henry Ford: “A man who cannot think is not an educated man however many college degrees he may have acquired. Thinking is the hardest work any one can do – which is probably the reason why we have so few thinkers… If education consisted in warning the young student away from some of the false theories on which men have tried to build, so that he may be saved the loss of the time in finding out by bitter experience, its good would be unquestioned. An education which consists of signposts indicating the failure and the fallacies of the past doubtless would be very useful…the best that education can do for a man is to… teach him how to think.” – Henry Ford, My Life and Work, with S. Crowther, 1922, page 247 and 248.